Hartlepool is a town and unitary authority in County Durham, England. The town lies on the North Sea coast, 7.5 miles (12 km) north of Middlesbrough and 17 miles (27 km) south of Sunderland. The Borough of Hartlepool includes outlying villages such as Seaton Carew, Greatham and Elwick. Hartlepool was founded in the 7th century AD, around the monastery of Hartlepool Abbey. The village grew in the Middle Ages and its harbour served as the official port of the County Palatine of Durham. After a railway link from the north was established from the South Durham coal fields, an additional link from the south, in 1835, together with a new port, resulted in further expansion, with the new town of West Hartlepool. Industrialisation and the start of a shipbuilding industry in the later part of the 19th century caused Hartlepool to be a target for the Imperial German Navy at the beginning of the First World War. A bombardment of 1,150 shells on 16 December 1914 resulted in the death of 117 people. A severe decline in heavy industries and shipbuilding following the Second World War caused periods of high unemployment until the 1990s when major investment projects and the redevelopment of the docks area into a marina saw a rise in the town's prospects. The 8th Century Northumbrian chronicler Bede referred to the spot on which today's town is sited upon as "the place where deer come to drink", and in this period the Headland was named by the Angles as Heruteu (Stag Island). At the beginning of the 11th Century the name had evolved into Herterpol, and post Norman Conquest the name of the village sited there evolved in Middle English as: Hart-le-pool ("The Pool of the Stags"). Archaeological evidence has been found below the current high tide mark that indicates that an ancient post-glacial forest by the sea existed in the area during this period. Nearby towns and cities include: Billingham (8 mi or 13 km): Darlington (25 mi or 40 km); Durham (17 mi or 27 km); Middlesbrough (12 mi or 19 km); Peterlee (8 mi or 13 km); Seaham (17 mi or 27 km); Sedgefield (13 mi or 21 km); Stockton-on-Tees (10 mi or 16 km) and Sunderland (21 mi or 34 km). The monument at Eston Nab can be seen, beyond the far side of the Tees Bay, to the south. After the Roman Empire abandoned its province of Britannia in the early 5th Century, its North-Eastern sea coast began to be piratically raided by the Angles from across the North Sea in Scandinavia. They subsequently began crossing the North Sea and settled in the area, creating the Kingdom of Northumbria. Hartlepool began as an Anglian settlement, and a town developed in the 7th Century A.D. sited around Hartlepool Abbey, which had been founded in 640 A.D. by the Irish Christian priest Saint Aidan upon a headland overlooking a natural harbour and the North Sea. The monastery became powerful under St Hilda, who served as its abbess from 649–657 A.D. The Abbey fell into decline with the loss of Northumbrian power in the early 8th Century, and it was probably destroyed during a sea raid by Vikings on Hartlepool in the 9th Century. In March 2000, the archaeological investigation television programme Time Team located the foundations of the lost monastery in the grounds of St Hilda's Church. During the Norman Conquest the De Brus family gained over-lordship of the land surrounding Hartlepool. William the Conqueror subsequently ordered the construction of Durham Castle, and the villages under their rule were mentioned in records in 1153 when Robert de Brus, 1st Lord of Annandale became Lord of Hartness. The town's first charter was received before 1185, for which it gained its first mayor, an annual two-week fair and a weekly market. 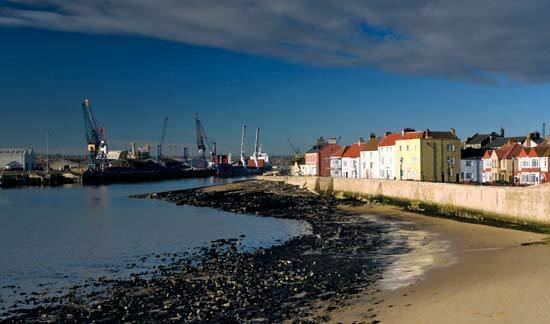 By the Middle Ages Hartlepool was growing into an important (though still small) market town, one of the reasons for its escalating wealth being that its harbour was serving now as the official port of the County Palatine of Durham. The main industry of the town at this time was fishing, and Hartlepool in this period established itself as one of the primary ports upon England's Eastern coast. In 1306, Robert the Bruce was crowned King of Scotland, and became the last Lord of Hartness. Angered, King Edward I confiscated the title to Hartlepool, and began to improve the town's military defences in expectation of war. In 1315, before they were completed, a Scottish army under Sir James Douglas attacked, captured and looted the town. In the late 15th Century a pier was constructed to assist in the harbour's workload. Hartlepool was once again militarily occupied by a Scottish incursion, this time in alliance with the Parliamentary Army during the English Civil War, which after 18 months was relieved by an English Parliamentarian garrison. In 1795 Hartlepool artillery emplacements and defences were constructed in the town as a defensive measure against the threat of French attack from seaborne Napoleonic forces. During the Crimean War two coastal batteries were constructed close together in the town to guard against the threat of seaborne attacks from the Imperial Russian Navy, they were entitled the Lighthouse Battery (1855) and the Heugh Battery (1859). By the early nineteenth century, Hartlepool was still a small town of around 900 people, with a declining port. In 1823 the council and Board of Trade decided that the town needed new industry, so the decision was made to propose a new railway to make Hartlepool a coal port, shipping out minerals from the Durham coalfield. It was in this endeavour that Isambard Kingdom Brunel visited the town in December 1831, and wrote: "A curiously isolated old fishing town – a remarkably fine race of men. Went to the top of the church tower for a view." But the plan was faced by local competition from new docks. 25 kilometres (16 mi) to the north, the Marquis of Londonderry had approved the creation of the new Seaham Harbour (opened 31 July 1831), while to the south the Clarence Railway connected Stockton-on-Tees and Billingham to a new port at Port Clarence (opened 1833). Further south again, in 1831 the Stockton and Darlington Railway had extended into the new port of Middlesbrough. The council agreed the formation of the Hartlepool Dock and Railway Company (HD&RCo) to extend the existing port by developing new docks, and link to both local collieries and the developing railway network in the south. In 1833, it was agreed that Christopher Tennant of Yarm establish the HD&RCo, having previously opened the Clarence Railway (CR). Tennant's plan was that the HD&RCo would fund the creation of a new railway, the Stockton and Hartlepool Railway, which would take over the loss-making CR and extended it north to the new dock, thereby linking to the Durham coalfield. After Tennant died, in 1839, the running of the HD&RCo was taken over by Stockton-on-Tees solicitor, Ralph Ward Jackson. But Jackson became frustrated at the planning restrictions placed on the old Hartlepool dock and surrounding area for access, so bought land which was mainly sand dunes to the south-west, and established West Hartlepool. Because Jackson was so successful at shipping coal from West Hartlepool through his West Hartlepool Dock and Railway Company and, as technology developed, ships grew in size and scale, the new town would eventually dwarf the old town. The 8 acres (0.032 km2) West Hartlepool Harbour and Dock opened on 1 June 1847. On 1 June 1852 the 14 acres (0.057 km2) Jackson Dock opened on the same day that a railway opened connecting West Hartlepool to Leeds, Manchester and Liverpool. This allowed the shipping of coal and wool products eastwards, and the shipping of fresh fish and raw fleeces westwards, enabling another growth spurt in the town. This in turn resulted in the opening of the Swainson Dock on 3 June 1856, named after Ward Jackson’s father-in-law. In 1878 the William Gray & Co shipyard in West Hartlepool achieved the distinction of launching the largest tonnage of any shipyard in the world, a feat to be repeated on a number of occasions. 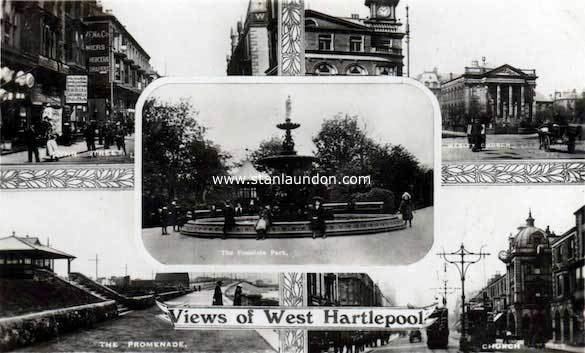 By 1881, old Hartlepool's population had grown from 993 to 12,361, but West Hartlepool had a population of 28,000. Ward Jackson helped to plan the layout of West Hartlepool and was responsible for the first public buildings. He was also involved in the education and the welfare of the inhabitants. In the end, he was a victim of his own ambition to promote the town: accusations of shady financial dealings, and years of legal battles, left him in near-poverty. He spent the last few years of his life in London, far away from the town he had created. In 1891 the two towns had a combined population of 64,000. By 1900 the two Hartlepools were, together, one of the three busiest ports in England. The modern town represents a joining together of "Old Hartlepool", locally known as the "Headland", and West Hartlepool. As already mentioned, what was West Hartlepool became the larger town and both were formally unified in 1967. Today the term "West Hartlepool" is rarely heard outside the context of sport, but one of the town's Rugby Union teams still proudly retains the name (See Sports below). The name of the town's professional football club reflected both boroughs; when it was formed in 1908, following the success of West Hartlepool in winning the FA Amateur Cup in 1905, it was called "Hartlepools United" in the hope of attracting support from both towns. When the boroughs combined in 1967 the club renamed itself "Hartlepool" before re-renaming itself Hartlepool United in the 1970s. Many fans of the club still refer to the team as "Pools". Two coastal defence batteries at Hartlepool returned fire, launching 143 shells, and damaging three German ships: SMS Seydlitz, SMS Moltke and SMS Blücher. The Hartlepool engagement lasted roughly 50 minutes, and the coastal artillery defence was supported by the Royal Navy in the form of four destroyers, two light cruisers and a submarine, none of which had any significant impact on the German attackers. Private Theophilus Jones of the 18th Battalion Durham Light Infantry, who fell as a result of this bombardment, is sometimes described as the first military casualty on British soil by enemy fire. This event (the death of the first soldiers on British soil) is commemorated by the 1921 Redheugh Gardens War Memorial together with a plaque unveiled on the same day (seven years and one day after the East Coast Raid) at the spot on the Headland (the memorial by Philip Bennison illustrates four soldiers on one of four cartouches and the plaque, donated by a member of the public, refers to the 'first soldier' but gives no name). A living history group, the Hartlepool Military Heritage Memorial Society, portray men of that unit for educational and memorial purposes. Hartlepudlians voluntarily subscribed more money per head to the war effort than any other town in Britain. Hartlepool suffered badly in the Great Depression of the 1930s and endured high unemployment until the start of the Second World War, during which its shipbuilding and steel-making industries enjoyed a renaissance. Most of its output for the war effort were "Empire Ships". German bombers raided the town 43 times, though, compared to the previous war, civilian losses were lighter with 26 deaths recorded by Hartlepool Municipal Borough and 49 by West Hartlepool Borough. During the Second World War, RAF Greatham (also known as RAF West Hartlepool) was located on the South British Steel Corporation Works. After the war, both industries went into a severe decline. Blanchland, the last ship to be constructed in Hartlepool, left the slips in 1961. In 1967 Betty James wrote how "if I had the luck to live anywhere in the North East [of England]...I would live near Hartlepool. If I had the luck". There was a boost to the retail sector in 1970 when Middleton Grange Shopping Centre was opened by Princess Anne, with over 130 new shops including Marks & Spencer and Woolworths. Before the shopping centre was opened, the old town centre was located around Lynn Street, but most of the shops and the market had moved to a new shopping centre by 1974. Most of Lynn Street had by then been demolished to make way for a new housing estate. Only the north end of the street remains, now called Lynn Street North. This is where the Hartlepool Borough Council depot was based (alongside the Focus DIY store) until it moved to the marina in August 2006. In 1977 the British Steel Corporation announced the closure of its Hartlepool steelworks with the loss of 1500 jobs. In the 1980s the area was afflicted with extremely high levels of unemployment, at its peak consisting of 30 per cent of the town's working age population, the highest in the United Kingdom. 630 jobs at British Steel were lost in 1983, and a total of 10,000 jobs were lost from the town in the economic de-industrialization of England's former Northern manufacturing heartlands. Between 1983 and 1999 the town lacked a cinema, and areas of it became afflicted the societal hallmarks of endemic economic poverty, with urban decay, high crime levels, and drug and alcohol dependency being prevalent. After boundary changes introduced in 2012, Hartlepool is now divided into eleven electoral wards, each of which elect three councillors who make up the 33 councillors of the Borough Council. Hartlepool falls within the jurisdiction of Cleveland Police. Before 1974, it was under the jurisdiction of the Durham Constabulary. Hartlepool is covered by the Cleveland Fire Brigade which has two stations in Hartlepool: a full-time station at Stranton and a retained station on the Headland. The town had planned to receive funding from central government to improve school buildings and facilities as a part of the Building Schools for the Future programme, but this was cancelled because of government spending cuts. Hartlepool College of Further Education is an educational establishment located in the centre of the town, and existed in various forms for well over a century. The recently demolished campus was built in the 1960s. The new £52million custom-designed building was approved in principle July 2008, and construction was complete for September 2011. Hartlepool also has its own specialist sixth form college, Hartlepool Sixth Form College. A former grammar and comprehensive school, the college provides a number of AS and A2 Level courses for students across the town. The English Martyrs School and Sixth Form College also offers AS, A2 and other BTEC qualification to 16- to 18-year-olds from Hartlepool and beyond. A campus of Cleveland College of Art & Design, the only remaining specialist art and design college in the North East that teaches Higher Education, is located in Hartlepool, alongside the Art Gallery in Church Square. The College has a further site in Middlesbrough that facilitates Further Education. Hartlepool's economy has historically been linked with the maritime industry, something which is still at the heart of local business. Hartlepool Dock is owned and run by PD Ports. Engineering related jobs employ around 1700 people, with companies such as Heerema employing around 400 people. Tata Steel Europe employ around 350 people in the manufacture of steel tubes, predominantly for the oil industry. South of the town on the banks of the Tees Able UK operates the Teesside Environmental Reclamation and Recycling Centre (TERRC), a large scale marine recycling facility and dry dock. Adjacent to the east of TERRC is the Hartlepool nuclear power station, an advanced gas-cooled reactor (AGR) type nuclear power plant opened in the 1980s. It is the single largest employer in the town, employing 1 per cent of the town's working age people. The chemicals industry is important to the local economy. Companies include Huntsman Corporation, who produce titanium dioxide for use in paints, Omya, Baker Hughes and Frutarom. Tourism was worth £48 million to the town in 2009; this figure excludes the impact of the Tall Ships 2010. 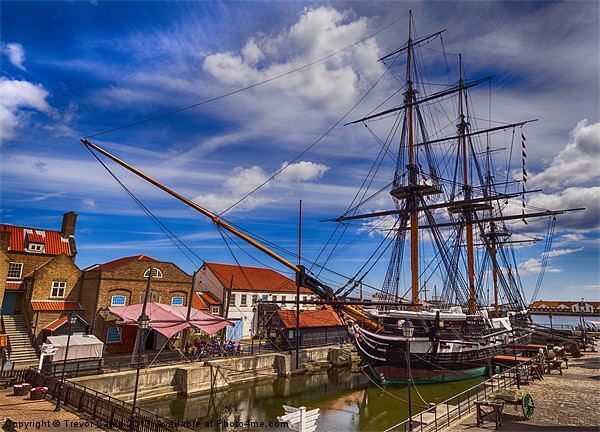 Hartlepool's historic links to the maritime industry are centred on the Maritime Experience, and the supporting exhibits PS Wingfield Castle and HMS Trincomalee. Camerons Brewery was founded in 1852 and currently employs around 85 people. It is one of the largest breweries in the UK. Following a series of take-overs, it came under the control of the Castle Eden Brewery in 2001 who merged the two breweries, closing down the Castle Eden plant. It brews a range of cask and bottled beers, most famously Strongarm, a 4% abv bitter. The brewery is heavily engaged in contract brewing such beers as Kronenbourg 1664, John Smith's and Foster's. Orchid Drinks of Hartlepool were formed in 1992 after a management buy out of the soft drinks arm of Camerons. They manufactured Purdey's and Amé. Following a £67 million takeover by Britvic, the site was closed down in 2009. Middleton Grange Shopping Centre is the main shopping location. 2800 people are employed in retail. The ten major retail companies in the town are Tesco, Morrisons, Asda, Next, Argos, Marks & Spencer, Aldi, Boots and Matalan. Aside from the local sports clubs, other local entertainment venues include a VUE Cinema and Mecca Bingo. Companies that have moved operations to the town for the offshore wind farm include Siemens and Van Oord. Hartlepool is served by two primary routes which are the A179 road and the A689 road, both linking the town to the A19 road. The A179 road is the main road to the north-west which leads to the A19 road, Durham, Sunderland and Tyneside. The A689 road is the main road to the south-west towards the A19 & Billingham, Stockton, Middlesbrough and York. The A178 road leads south to Seaton Carew, Graythorp, Seal Sands, Port Clarence and Middlesbrough via the Transporter bridge. The A1086 road leads north to Crimdon, Blackhall, Horden, Peterlee and Easington. Hartlepool is served by Hartlepool and Seaton Carew railway stations, both of which lie on the Durham Coast Line with hourly services to Sunderland, Newcastle and Middlesbrough, which are operated by Northern. A service to London from Sunderland, operated by Grand Central that uses High Speed and Class 180 trains capable of 125 miles per hour (201 km/h) operates from the former of the two stations. The service marks the first time since the 1980s that Hartlepool has had a direct rail link with London which takes around three and a half hours. The Stagecoach Group also operate service 36 from Hartlepool to Billingham, Stockton and Middlesbrough, as well as the faster service 1 to Middlesbrough via Seaton Carew and Port Clarence. Other services are provided by Arriva and Go North East from Hartlepool to Peterlee, Durham, Seaham, Hetton-le-Hole, Houghton-le-Spring and Sunderland. Hartlepool has been a major seaport virtually since it was founded, and has a long fishing heritage. During the industrial revolution massive new docks were created on the southern side of the channel running below the Headland, which gave rise to the town of West Hartlepool. Now owned by PD Ports, the docks are still in use today and still capable of handling large vessels. However, a large portion of the former dockland was converted into marina, capable of berthing 500 vessels. Hartlepool Marina is home to a wide variety of pleasure and working craft, with passage to and from the sea through a lock. Hartlepool has an oceanic climate typical of Great Britain. The Köppen Climate Classification subtype for this climate is "Cfb"(Marine West Coast Climate). Hartlepool United is the town's professional football club and they play at Victoria Park, Hartlepool. They won promotion to League One for the 2007–08 season. In their first season back in League One, after a brief absence, they finished 15th. In December 2008, the club parted company with manager Danny Wilson. The club's most famous day was in 2005 when, with just 8 minutes left in the 2005 Football League One play-off Final, the team gave away a penalty, allowing Sheffield Wednesday to equalise and eventually beat Hartlepool to a place in the Championship. Supporters of the club bear the nickname of Monkey Hangers. This is based upon a legend that during the Napoleonic wars a monkey, which had been a ship's mascot, was taken for a French spy and hanged. Hartlepool has also produced the nationally famous football presenter Jeff Stelling, who has a renowned partnership with Chris Kamara who was born in nearby Middlesbrough. West Hartlepool R.F.C. are more commonly known as "West" play in National League 3 North which is the 5th tier of the national league structure. In the mid-1990s, West played in what is now the Guinness Premiership. West were then hit by bankruptcy and controversially sold their Brierton Lane stadium. There then followed a succession of relegations as professional players left the club. Hartlepool Rovers play in the Durham/Northumberland 1 division. Other clubs include, Hartlepool BBOB & Seaton Carew. West Hartlepool TDSOB (Tech) ceased playing in 2008/09 year due to a high number of players leaving. The club continued to support town and County rugby with all of the towns other clubs playing at Grayfields when their own pitches were unavailable. The Club also hosted a number of Durham County cup finals as well as County Under 16, Under 18 and Under 20 age group games. In 2014 TECH once again started to field a team on a regular basis with the side competing in the Tees Valley leagues. In August 2012 21-year-old Savannah Marshall, who attended English Martyrs School and Sixth Form College in the town of Hartlepool, competed in the Women's boxing tournament of the 2012 Olympic Games. She was defeatead 12-6 by Marina Volnova of Kazakhstan in her opening, quarter-final bout. In August 2012 Jemma Lowe, a British record holder who attended High Tunstall College of Science in the town of Hartlepool, competed in the 2012 Olympic Games. She finished sixth in the 200-metre butterfly final with a time of 58.06 seconds. She was also a member of the eighth-place British team in the 400m Medley relay. On 28 June 2006 Hartlepool celebrated after winning its bid to host The Tall Ships' Races. The town welcomed up to 125 tall ships in 2010, after being chosen by race organiser Sail Training International to be the finishing point for the race. Hartlepool greeted the ships, which sailed from Kristiansand in Norway on the second and final leg of the race. Historians have pointed to the prior existence of a Scottish folk song called "And the Boddamers hung the Monkey-O". It describes how a monkey survived a shipwreck off the village of Boddam near Peterhead in Aberdeenshire. Because the villagers could only claim salvage rights if there were no survivors from the wreck, they allegedly hanged the monkey. There is also an English folk song detailing the later event called, appropriately enough, "The Hartlepool Monkey". In the English version the monkey is hanged as a French spy. "Monkey hanger" and Chimp Choker are common terms of (semi-friendly) abuse aimed at "Poolies", often from bitter footballing rivals Darlington. The mascot of Hartlepool United F.C. is H'Angus the monkey. The man in the monkey costume, Stuart Drummond, stood for the post of mayor in 2002 as H'angus the monkey, and campaigned on a platform which included free bananas for schoolchildren. To widespread surprise, he won, becoming the first directly-elected mayor of Hartlepool, winning 7,400 votes with a 52% share of the vote and a turnout of 30%. He was re-elected by a landslide in 2005, winning 16,912 on a turnout of 51% – 10,000 votes more than his nearest rival, the Labour Party candidate. The monkey legend is also linked with two of the town's sports clubs, Hartlepool Rovers RFC, which uses the hanging monkey as the club logo. On tours it would hang a monkey on the posts of the rugby pitch to spread the story. Hartlepool (Old Boys) RFC use a hanging monkey kicking a rugby ball as their tie crest.